Why Do You Need Project Management Templates? Think of the last project you had to manage. What documents did you have to create at launch? There would be a project charter and a communication plan, of course. You’d have a broad project plan, a work breakdown structure, and a Gantt chart. You would also have a risk register and a plan to tackle all upcoming issues. Creating all these documents from scratch would waste a monumental amount of time. This is why every project manager usually has a trusted arsenal of project management templates. How to Use Project Management Templates? Once downloaded, edit them with your own details and export in your chosen format. If you don’t have Excel or Word, you can use LibreOffice as an open-source alternative. Alternatively, upload the file to your Google MyDrive account. Google will convert the file and you can open it in Google Sheets (for XLS files) or Google Docs (for .Doc files). To make the searching process easier, I’ve organized the templates into different categories below. As we pointed out earlier, the first step in developing an integrated project plan is to create a project charter. This is an important document that outlines the scope, objectives, and stakeholders involved in the project. It documents everything the project needs and its expected outcomes. The project charter also doubles up as a business case document. In case you need to convince stakeholders of the importance of a project, or outline the goals to your team, you will turn to the project charter. Project title: Start with the title. Make sure it is specific enough to make identification easier. A good template to follow is this - "[Project Type] to [Project Objective] for [Project Client/Product]". For example, "Inbound Marketing Campaign to Increase Marketing Qualified Leads for Apple Corporation". Executive summary: Include a high-level summary of the project, its purpose, and its stakeholders. Project objectives: Explain the "why" of the purpose in greater detail. Be very specific about the outcomes you seek. It's a good idea to include specific numbers or at least a range. Don't say "increase traffic"; say "increase website traffic by 200% in 6 months". Business objectives: Use this section to describe how the project fits into the business' broader strategic goals. For instance, if you're running a campaign to increase traffic to a website, describe how the higher traffic would help the business in achieving its goals. Project requirements: Explain the project's requirements in terms of resources - both tangible and intangible - at a high-level. Project scope: Use this section to answer the question: "What is the project meant to accomplish?" Focus on both long and short-term goals & objectives, but briefly. Key deliverables: Briefly list the key deliverables at different milestones. Project schedule: Give a high-level overview of the project's estimated schedule. You don't have to be accurate down to the day, but a broad explanation of key milestones will help. Project budget: Give a high-level description of the project's budget. You can break this down by resource requirements if you want to go into more detail. Besides the above, you can also include a list of project stakeholders, roles, milestones, risks, and the completion/success criteria for the project. Keep in mind that this list is by no means exhaustive. You can expand or shrink the charter based on your own needs. For most projects, however, including the above will be enough. It might surprise you to learn this, but the CDC offers a number of high-quality project management templates for free. They don’t look particularly good, but they have fields for all the necessary data. This project charter template also includes detailed instructions on how to use it. A simpler but more visually appealing project charter template from NYU’s management school. A general-purpose project charter template from Solarity, a project management consultancy. This one is fairly detailed and with a neutral design that can be deployed quickly. This project charter template is designed specifically for use by project managers in agency settings. It can also double up as a business proposal given its focus and depth. Instead of using complicated templates, you can also use a project management software such as Workamajig to create project charters and organize all your documents. Learn more about Workamajig’s PM capabilities here. There is no fixed "recipe" for making a project plan. You can be as detailed or superficial as you need to be. Unlike the project charter, which is meant for stakeholders on both sides of the table, the project plan is mostly to cue you and your team into the project and its goals. Think of it as a simplified, distilled form of the project charter, but less formal. Keep in mind that this is a living document. You can modify it as the project progresses and you learn new things. It doesn't have to be comprehensive; it just needs to tell you and your team what they need to accomplish. Project identification: Include details about the project, including its name, description, ID, client, and project manager's name. Project dates: Identify the start and estimated end date of the project. You can also include a counter indicating the number of days left until the end date. Progress: Mention how much of the project has been completed so far in terms of milestones accomplished. Tasks/activities/deliverables: You can include a broad overview of key tasks, activities or deliverables, depending on the level of granularity. In complex projects, for instance, you might want to focus on deliverables, while in smaller projects, you can specify the exact tasks needed to produce said deliverables. Task details: Include details about each task’s start and end dates, the team or person responsible for it, and the task status. Timeline or Gantt chart: You can also include a timeline or Gantt chart showing dependencies and progress for each task. This project plan template focuses on tasks instead of deliverables or milestones. It includes a Gantt chart to visualize project progress. Use it for smaller projects with a small number of tasks and dependencies. 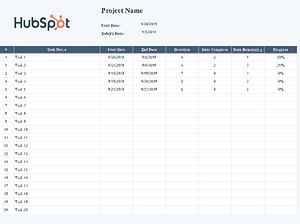 This project schedule template segregates the entire project into multiple phases. Each phase is further divided into multiple activities to give you a broad overview of the project’s progress. The timeline is one of the most important elements in any project plan. This template eschews a long list of tasks to focus on a few broad activities and their completion dates. Use it to keep your team on track or to make presentations to stakeholders. This template includes a detailed list of activities and tasks related to them, all visualized in the form of a Gantt chart. You can use this for nearly any project, though you might want to create separate Gantt charts for more complex projects. How is the project coming along? Are you on track to meet your deadlines? This project timeline template will help you answer these questions. Use it to keep track of key milestones and check up on your progress. Create detailed project plans and track project progress using Workamajig. Click here to learn more. Creating project status reports is the bread and butter of any project manager's job. You'll have to create weekly, monthly, and even daily reports to alert stakeholders about the health of the project. Creating effective reports is an art; you have to be detailed but succinct. So what all should you include in your project status report? Task progress: Clearly identify all tasks that have been accomplished since the last reporting period, what you're working on currently, and what's coming up in the next reporting period. Issues, risks and change requests: List all current issues and their status (open, closed, pending). Also list change requests and their history. Your goal should be to alert stakeholders about any issues that need their immediate attention. Milestones & deliverable: Identify all milestones completed since the last reporting period. Also identify upcoming milestones & deliverables as well as their start/finish dates. Refer to this article to learn how to create a creative project status report. If you'd rather use something pre-cooked, refer to the templates below. This template from the Office template library is short and to the point. It has fields to summarize the project status, give an overview of the project’s key tasks, budget, and issues. This in-depth template from the University of Manitoba comes with clear instructions on how to use it. You get enough space to list your key accomplishments since the last month, important KPIs, and the project’s financial health. It also has a separate section to add notes and metrics for internal use. This template from MyPM has fields to report key accomplishments, project schedule, schedule variance, budget details, risks, and issues. Use it if you need more in-depth reports. Need to give a high-level summary of the project to top stakeholders? Then this template is for you. Created by the CDC, this report does away with all superficial fields to focus on key milestones, issues, and an overall project summary. Most importantly, it also includes space to make executive requests. Create detailed project status reports in minutes with Workamajig. Learn more about Workamajig’s project management capabilities here. As a project manager, one of your core responsibilities is managing your team's schedule. What task each employee has to work on, on what days, and for how many hours is essential for running a project smoothly. As far as project management documents go, work schedules are fairly straightforward. Let’s look at some templates below. This detailed weekly work schedule template includes fields to add hourly pay rates, total pay, and daily activities for each employee. Although designed for shift workers, you can use it in an agency setting as well. You might need to create detailed daily schedules for some resources, such as designers working on multiple projects simultaneously. This template will come in handy in such cases. This detailed daily work schedule is perfect for managing the daily activities of your resources by the hour. It also includes a list of activities for the week along with room for adding notes. Instead of using templates, save time by using a resource and traffic management software to manage your team. Learn more about Workamajig’s resource management capabilities here. The work breakdown structure is one of the more important documents you'll create in the course of managing a project. As we noted earlier, the work breakdown structure involves breaking down deliverables into smaller, more manageable chunks. Thus, you might break down a bicycle into "wheels, frame, handle", and wheels into "rims, spokes, tires". A work breakdown structure can have as many levels as necessary, but for most projects, you won't need to go beyond 4-5 levels of decomposition. If you need to use verbs to break down the deliverables further (i.e. you are describing activities), you're doing something wrong. The deliverables at the last level of any WBS are called a "work package". A work package describes all the work necessary to create a single deliverable. A project, then, is a collection of work packages. Creating a work breakdown structure requires a clear understanding of what a WBS actually involves. You also need to understand the project's scope, list deliverables, and determine work packages. Follow the advice in this article on work breakdown structures to learn more. This template uses the tabular format to organize deliverables into different levels. It also includes room to add notes for each deliverable. A downside is that there is no clear visual hierarchy between deliverables at different levels. This template uses the familiar flowchart format for defining deliverables at different levels. You can add your deliverables in the spreadsheet and Excel will automatically sort them into a flowchart. Great for visually defining hierarchies. Need a simple WBS template without all the complexities of Excel? Then this template is for you. Made in Word, you can just edit the text to add your own deliverables. The only downside is that it only supports three levels of deliverables. Create work schedules in minutes using Workamajig. Learn more here. Another one of your responsibilities as a project manager is to track and report how your team spends its time. You'll need this not just to track productivity but also to create client reports. An automated time tracking solution built into your project management software is ideal for this purpose. Tools like Workamajig can track what your team is doing and create detailed reports for clients. However, in case you don't have access to a time tracking tool, you can also use timesheets and fill them up manually. This template is designed to track a specific employee’s activities for the entire week. It has room to include details about the client, project, billable hours, and rate for each day. This highly customizable template can be modified to cover any reporting period. By default, it includes fields for identifying the date, project ID, task ID, hours worked, and billable rates. You can change it to cover a specific period and track weekly progress. Need a broader monthly view of an employee’s activities? Then this monthly timesheet template is for you. Use it to track how many hours the employee spent on specific project activities on each day of the week. Use Workamajig’s resource management capabilities to track employee activities automatically and create detailed reports. As project managers like to say, communication is about 90% of their job. From delegating tasks and solving issues to keeping stakeholders updated on the what, why, and when of the project, you'll spend most of your time communicating. A solid communication plan will make your job infinitely easier. Communication plans help you communicate faster, anticipate client needs, alert your team about issues before they happen, and standardize communication across your entire organization. You can read more about creating a communication plan here. For a broader understanding of communication in project management, refer to this article on the 5 critical elements of communication plans. Use this article to set goals for your communication plan. As with most templates offered by the CDC, this one too is highly detailed with clear instructions on how to use it. It includes a section for stakeholder analysis, version control, and a communication matrix. Although not the best looking templates around, it is detailed enough for most projects. This template from the MS Office library is meant for marketing teams but can be used in any agency. It includes several sections to streamline communication, including provisions for a risk management plan, change management, and team structure. This is one of the most in-depth communication plan templates online. Besides the usual sections, it includes a “stakeholder interest/power grid” to map the importance vs. interest of each stakeholder. It also includes a section to list your communication principles to ensure consistency across all messages. Created by Marc Arnecke, PMP, this highly customizable project management template can be used in nearly any project. It includes detailed plans for managing meetings, analyzing stakeholders, and developing communication principles. Use Workamajig to keep track of all project documents, including communication plans, to streamline your agency’s operations. Learn more here. There are issues in every project that can impact its success. Anticipating these issues and developing strategies to tackle them is done via the risk management plan. Risk probability: What is the probability that a risk will actually occur? Project managers usually look at historical data, industry benchmarks, and known issues to estimate the probability of each risk. Risk impact: What is the impact of the risk on the project? Usually, you'll list the subjective impact of the risk first and assign it an objective rating on a 1-5 scale (1 = lowest impact, 5 = project derailment). Risk priority: Based on the risk probability and impact, you can calculate its priority. A high probability, high impact risk would have top priority. Risk response: How do you seek to mitigate the risk? The risk management plan should contain clear first response steps in case the risk actually happens. This detailed template was created by the state of Georgia for all its internal projects. It includes sections for qualitative and quantitative risk analysis, risk mitigation, and best practices. You can also find detailed instructions on how to use it in your own projects. Created by Marc Arnecke, PMP, this flexible risk management plan template can be used in nearly any project. It includes room to explain your risk management approach, methodology, and key roles. It also includes a probability/impact matrix to quantify the importance of each risk. UTDallas’s risk management plan template is short and simple with room to document risks, their priorities, and mitigation steps. Use it in simple projects where risks are fairly straightforward and easy to identify. Gantt charts, as we learned earlier, is one of the most prominent charting techniques in project management. Though nearly a century old, Gantt charts still find use across industries in projects of varying complexities. As a project manager, you’ll use Gantt charts extensively. Anything that can be broken down into constituent tasks can be represented on a Gantt chart. Not only does this help you visualize deadlines, but it can also help you understand task dependencies. Refer to this article to learn more about Gantt charts, their advantages/disadvantages, and how to use them. While you can create your own charts from scratch in Excel, you’ll save a lot of time by using Gantt chart templates. For an even easier solution, consider using a project management software with built-in Gantt charts, such as Workamajig. This template includes a detailed list of tasks, their start/end dates, current progress, and of course, a Gantt chart to visualize everything. You can use this in nearly any project. If you want a simple Gantt chart that can be put to use for any project quickly, this is the template for you. Available from the MS Office template library, this template is quite flexible and can be used for small and medium-sized projects. Need a Gantt chart that can also double up as a project plan? Then this is the template for you. Instead of detailed task views, this one focuses on broad activities and their timelines. Use it as a project plan or expand it to create a more detailed chart of all project tasks. Gantt charts are not only useful for managing project activities; they can also be used to visualize the project’s progress for clients. This PowerPoint template can help you show clients and stakeholders how the project will unfold. Need a Gantt chart template specifically designed for project managers leading complex projects? This one will help. With detailed task lists and a neutral design, this template is perfect if you have to manage a large project with a long list of activities. Download: dhtmlx.com (Zip file) - Standard edition is free; additional charge for PRO edition. This easy-to-use Gantt chart template is a part of HubSpot's project anagement template series, which also includes templates for project memos, budgets, and checklist. The download pages also includes instructions on how to use the template. The risk register identifies all the potential risks to the project based on current assumptions and past results. This is a living document that will be updated throughout the project as new risks surface. Juggling dozens of templates can get pretty hard pretty quickly. A much faster way to run projects is to use project management software that can create status reports, Gantt charts, project schedules, and work breakdown structures for you automatically. Workamajig can help you create all these reports, and more. Check it out by clicking the link below.